The Kentucky Community and Technical College System (KCTCS) is offering a new scholarship to help students complete their associate degrees in two years or less. The 15 to Finish scholarship will pay $500 to students who successfully complete 15 credit hours in a semester and enroll for an additional 15 hours the next semester. Research shows students who take at least 15 hours a semester are more successful, graduate sooner and save money. Southcentral Kentucky Community & Technical College (SKYCTC) is one of KCTCS’s 16 colleges. Beginning this fall, students could start earning $1,500 in scholarships on their way to an Associate in Arts or Associate in Science degree and up to $2,000 if they are pursuing an Associate of Applied Science degree, which may take an additional semester. The scholarship also is another way KCTCS is helping increase Kentucky’s higher education attainment levels. The Council on Postsecondary Education set a goal to raise the percentage of Kentuckians with a postsecondary degree or certificate to 60 percent by the year 2030. Achieving this goal is critical if the Commonwealth hopes to accelerate job creation, grow the economy and expand Kentucky’s tax base through the contributions of a better-educated, productive workforce. New and current students are eligible for the 15 to Finish scholarship, and students enrolled in the scholarship program will retain eligibility if they transfer from one KCTCS college to another. 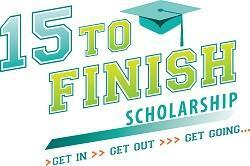 More information about the scholarship, including how to apply, is available on the KCTCS website?.